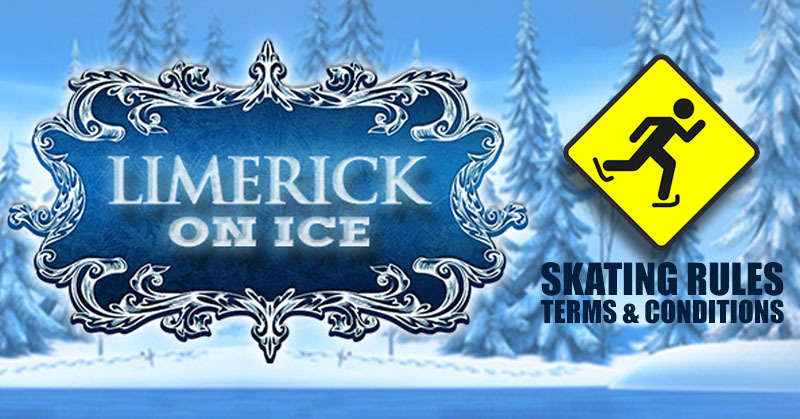 All skaters and customers of Limerick on Ice are urged to take note of our terms and conditions set out below. To ensure a safe and enjoyable skating experience the management reserve the right to refuse entry or remove from the arena, without refund, any person who is unable to comply with the rules as shown here. (2) Please check your booking before placing the order as tickets once purchased are non-refundable. (3) Tickets are purchased for a specific date and session time. It is not possible to transfer the session booked. (4) It is the responsibility of the ticket holder to ascertain the date and time of their session, as late arrivals or no shows will not be refunded or transferred. 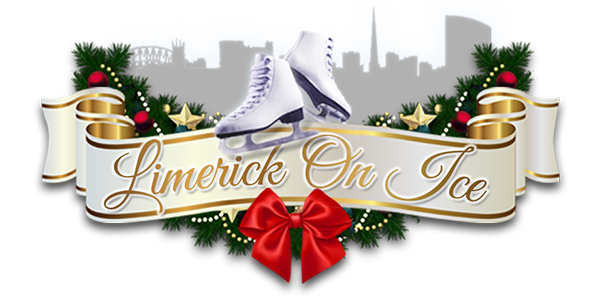 (5) In the unlikely event of any ‘Limerick On Ice’ ice-skating sessions being cancelled, ticket-holders for the sessions affected will be accommodated at alternative sessions. (6) If it becomes too late to post tickets out, due to circumstances beyond our control, we reserve the right to make tickets available for collection at the venue. (7) Tickets will not be replaced if lost, stolen or damaged. (8) Use of the ice skating rinks and all their facilities are totally at the users own risk. (9) No responsibility is accepted or undertaken for the well being of either the user or their property. (10) Children’s tickets are available to children aged 14 years or under. (11) ‘Limerick On Ice’ reserve the right to refuse admission, and to remove from the site any person whose condition or conduct, in the opinion of the staff of ‘Limerick On Ice’ interferes, or is likely to interfere with, the enjoyment of the session by other participants. (12) ‘Limerick On Ice’ does not accept any responsibility in respect of any person prevented from entering the ‘Limerick On Ice’ site, or asked to leave due to their conduct. (13) Any complaints should be made to the venue management either before or during the session and they will be dealt with immediately. Complaints made subsequently will not be entertained. (14) It is essential that skaters obey the ice marshals at all times. (15) Details of the event are subject to change without notice. (16) For health and safety reasons when skating, all personal belongings (bags, rucksacks, loose coats etc) and any valuables must be stored in the on-site cloakroom upon arrival. (17) You can turn up and you will probably get a ticket, however if you want to be guaranteed a particular time then we recommend that you book in advance. (18) There are additional handling fee for on-line bookings. (19) Tickets are non transferable and non-refundable. (19) Wheelchair access is available at “Limerick on Ice” and our staff are available to lend a helping hand. (20) “Limerick on Ice” have a limited number of Skate aids that are available to help you find your feet. (21) Ice Marshals patrol the ice to assist skaters to their feet should the need arise. (22) In the event of an accident first-aid facilities are on-site. (23) Gloves are highly recommended and an extra pair of socks for skaters is also a good idea! (24) “Limerick on Ice”rink and all its facilities are used totally at the users own risk. (25) You skate at your own risk, we cannot be responsible for injuries sustained as a result of ice skating. (26) You are advised to wear warm light clothing if possible. (27) Do bring a change of socks just in case and be sure to wear gloves while skating. (29) By entering the Golden Ticket competition you agree to be entered upon our mailing list for further news and promotions from Futureama Productions unless declined by ticking the check box on the entry form.